Ethiopian-American relations relations were established in 1903, after nine days of meetings in Ethiopia between Emperor Menilik II and Robert P. Skinner, an American diplomat appointed by President Theodore Roosevelt. These relations have blossomed over more than a century and will continue to flourish in the decades ahead as long as the United States defends Ethiopia’s territorial integrity and sovereignty and as long as the government of the U. S. sides with all of the Ethiopian people and support their aspirations for justice, the rule of law, equality of treatment and democracy. Relations between the American and Ethiopian people are stronger today than they have ever been. Ethiopian culture and food are as common in Peoria as they are in Washington D.C. Ethiopian-Americans have begun to participate in the electoral process in a systematic way. 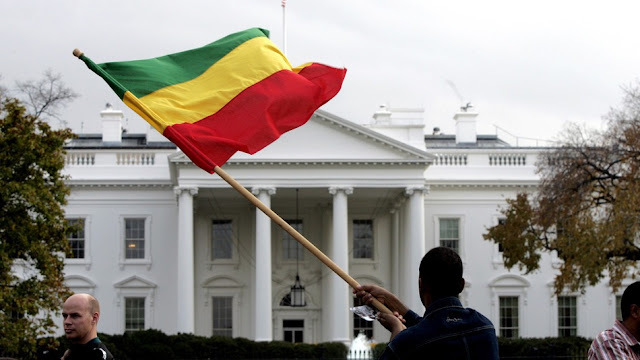 In the decades ahead, Ethiopian-Americans will use their voting power to influence policy. In this commentary I strongly suggest that it is no longer in America’s long-term strategic and national security interests to continue to bankroll the Tigray People’s Liberation Front (TPLF) dominated regime in Addis Ababa. This regime is cruel, repressive, corrupt, tribal and anti-democratic. It undermines peace and stability. It has made Ethiopia more unstable and susceptible to terrorism, fundamentalism and extremism. A regime that terrorizes its own people can no longer serve as a reliable ally in the struggle against terrorism. Senators James Inhofe(R-O), ranking member of the Senate Armed Services Committee and Michael Enzi paid a visit to Ethiopia and met with Prime Minister Hailemariam Dessalegn. The Senators emphasized the importance of American-Ethiopian bilateral relations and underscored the bonds between the American and Ethiopian people that span more than a century. It is these people to people relations that buffet US and Ethiopian government partnerships. Regimes change; people to people relations endure. In this regard, the Government of the United States must begin to recognize that the welfare and wellbeing of the Ethiopian people is paramount to a durable partnership; peace and stability in the Horn of Africa; and that this principle of placing Ethiopians in the forefront of American foreign policy is consequential for both nations. Regional security should go hand in hand with citizens’ welfare and their just and fair treatment by their own government. This is not the case in Ethiopia today. The “ongoing tensions” and civil conflict, most notably between Oromo and Somali Ethiopians that resulted in the senseless deaths of “hundreds of Oromo civilians” and the displacements of at least 100,000 Oromo Ethiopians is a travesty for which the regime in Addis Ababa should be held accountable. Who is behind the killings and displacements of Oromo Ethiopians? Land grab and expansionism are both triggered by the TPLF core leadership that mirrors a political narrative and practices of ethnic elite political and economic capture. The impact of this model is uneven regional development and gaping social and income inequality, says the World Bank for the first time. These conditions of bad, exclusionary and repressive governance breed resentment, civil conflicts, worsen instability and embolden extremist and fundamentalist groups to establish beachheads in an already volatile and conflict-ridden region. It allows external forces to encircle Ethiopia. When Senators Inhofe and Enzi “expressed a sincere desire to provide whatever assistance” Ethiopia needs to address the ongoing conflict, many Ethiopians understood them to mean endorsement of a guiding principle on Ethiopia that U.S. Secretary of State Rex Tillerson announced earlier this year. “We remain committed to working with Ethiopia to foster liberty, democracy, economic growth, protection of human rights, and the rule of law.” The same was said by President Obama. The U.S. provided the latest electronic surveillance technology, operational support and training to Ethiopia. In return, Ethiopia opened itself up and granted the U.S. access to its strategic lands and locations with no monitoring mechanism in place. The TPLF-dominated security forces were completely free to use the surveillance system as well as the large number of trained federal police, special security units and personnel under the leadership of TPLF officers to do as they wish. Consequently, this Orwellian type of surveillance by the TPLF leadership poses enormous risks for the U.S. in that its partnership would be abused, misused and misdirected. It afforded the TPLF to apply the draconian Anti-Terrorism Proclamation under which any opponent, political dissident, journalist or human rights advocate was arrested, accused and sentenced as a terrorist. Many innocent people were tortured and incapacitated under the Anti-Terrorism Proclamation. According to an NSA expert report by Katie Pierce dated 2005, “The benefit of this relationship is that the Ethiopians provide the location and linguists and we provide the technology and training.” Ethiopia located American outfit Lion’s Pride “produced almost 7,700 transcripts and more than 900 reports” based on its regional spying effort in the Horn of Africa. This surveillance system in Ethiopia is among the most sophisticated in the world; and it gives the U. S. superiority over other nations. Intercept’s investigative journalism shows the involvement of numerous high level American military and intelligence officers in the establishment of this counterterrorism, intelligence and security system that continues to this day. This carte blanche support by the U.S. to a most hated and illegitimate regime in Addis Ababa put all Ethiopians at risk. It should worry American policy and decision-makers that the war against terrorism is equally used by the regime in Ethiopia to terrorize, torture, maim, forcibly evict and cause other harms to Ethiopians in the Amhara, Afar, Gambella, Beni-Shangul Gumuz, Omo Valley and Konso, Oromia and Somali regions. The regime’s harm to its own citizens is so egregious that it has made the entire country a living hell. There isn’t any part of Ethiopia where there is peace and a sense of lawfulness. In some parts of the country, there is literally no government authority. Most recently, high officials of the party, state and government have begun the unprecedented procedure of offering their resignations. Others have fled the country with their families and ill-gotten wealth. I cannot find any Ethiopian who is convinced that the relationship between U.S. and Ethiopian surveillance activities are distinct or distinguishable from one another. One seems to reinforce the other. The regime’s uses them as fungible. The TPLF deploys agents within and outside the country and infringes on citizens’ rights by ignoring international human rights laws. Within the country’s borders, the agents are free to apply inhumane measures in extracting information. Extrajudicial killings are so common that during the 2016-2018 popular uprisings more than 1,000 innocent Oromo, Amhara and Konso youth were summarily executed by TPLF forces. Tens of thousands were jailed. Following its takeover of the government in 1991 and before, the TPLF committed crimes against the Amhara population in Gondar and in numerous parts of Southern and Eastern Ethiopia, many being thrown alive into ditches. Tens of thousands of Amhara were evicted from their lands and property in Beni-Shangul Gumuz, Gambella, Gura Ferda of the Southern Nations, Nationalities and Peoples. Lands were grabbed from the peoples of Gondar, Gojjam and Wollo and incorporated into Greater Tigray. All told, extrajudicial measurers, human rights violations, continued eavesdropping on Ethiopian civilians, especially youth, abducting dissenters from neighboring countries such as Kenya and South and North Sudan, recurring displacements of innocent people from their lands; as well as party, state and government corruption contribute to the chaos, disorder and instability that now threaten the durability of Ethiopia as a unified and viable country. There is absolutely no doubt in my mind that U.S. surveillance and security assistance to the TPLF dominated one party state and government undermines American-Ethiopian relations. It has emboldened the regime while creating favorable conditions for extremist, fundamentalist and terrorist groups to establish underground networks that will be harder to contain in the long-term. Ethiopia’s human rights situation is worse today than when President Obama visited Ethiopia in the summer of 2015. He said two things that his government never translated into action. “Nothing will unlock Africa’s economic potential more than ending the cancer of corruption.” Ethiopia is amongst the most corrupt nations on the planet. He also said “I believe Africa’s progress will also depend on democracy, because, Africans, like people elsewhere, deserve the dignity of being in control of their livers.” It is impossible to enjoy dignity without human rights and the protection of fundamental freedoms under the law. Similar sentiments have been expressed by Senators Inhofe and Enzi as well as Secretary of State Tillerson. It is about time that American policy makers do the right thing by siding with the Ethiopian people in order to serve their own long-term national interests while gaining the respect and admiration of the Ethiopian people at the same time. This is why I propose that siding with 105 million Ethiopians now will pay dividends in the long-run. I am encouraged by the Congressmen and Senators who respectively champion HR 128 in the House and S.R 168 in the Senate. It is time to pass these resolutions without much delay.